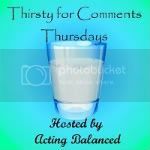 Welcome to the Thirsty for Comments Thursday blog hop! I've spent several posts ranting about blog hoppers who 'hit and run' to collect followers and numbers - That's not why I join blog hop memes, and I know from comments left on those rants, that others feel the same way... so I've decided to do something proactive and create Thirsty for Comments Thursdays! 3. Visit AT LEAST THREE other blogs and READ the posts and comment thoughtfully on the post. Please remember to link to a SPECIFIC POST not just your blog main page.